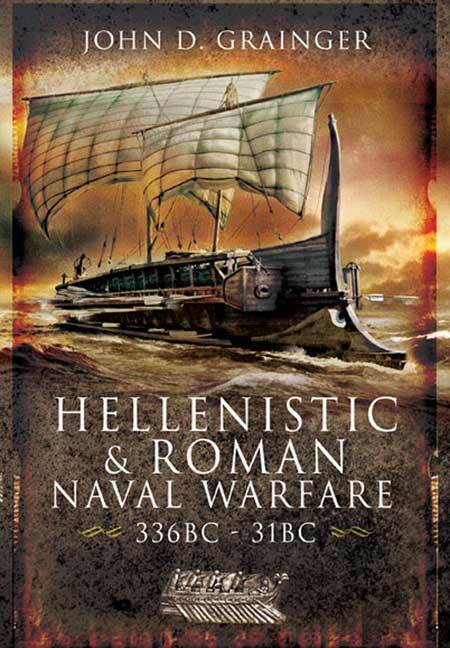 You'll be £4.99 closer to your next £10.00 credit when you purchase Hellenistic and Roman Naval Warfare 336BC-31BC. What's this? The period covered in this book, is well known for its epic battles and grand campaigns of territorial conquest, but Hellenistic monarchies, Carthaginians and the rapacious Roman Republic were scarcely less active at sea. Huge resources were poured into maintaining fleets not only as symbols of prestige but as means of projecting real military power across the Mediterranean arena. Taking the period between Alexander the Great's conquests and the Battle of Actium, John Grainger analyses the developments in naval technology and tactics, the uses and limitations of sea power and the differing strategies of the various powers. He shows, for example, how the Rhodians and the Romans eschewed the ever-larger monster galleys favoured by most Hellenistic monarchs in favour of smaller vessels. This is a fascinating study of a neglected aspect of ancient warfare. In “Hellenistic and Roman Naval Wars 336BC-31BC” author J.D. Grainger attempts to draw an overall view of naval warfare in a period going from Alexander’s campaigns to Actium. Of course such huge undertaking could be done in many ways and the size of the book, some two hundred pages, meant that some events could not be covered in this book. The nature of the sources is also an issue for who wants to look at such questions, with many of the wars of the period being badly or incompletely described, not to mention the usual bias which will, for example, see the Achean league politician Polybius heap insults on the Aetolian league’s “pirates”, which contributes to our difficulties in understanding the topic. The book presents itself as a chronological narrative of naval warfare in the eastern and western Mediterranean. Sixteen chapters allow us to look at different steps of the evolution of naval warfare, with a specific chapter also looking at the issue of piracy acting as an introduction to the chapter on Antonius and Pompey’s campaigns during the first half of the first century B.C. While Grainger pays close attention to the question of numbers of ships available to the protagonists, one might be disappointed at the lack of interest on the questions of training, logistics, economics and manpower. Admittedly the sources do not reveal much on those topics, but there is still information to be gathered and looking at classical naval warfare of the 5th and 4th centuries might also have provided information, especially since some classes of ships did not evolve very much between the two periods. Sources like the very detailed accounts of Athens’ naval arsenal are not really exploited by Grainger, and the “realia” aspect of naval warfare is completely forgotten. We truly have here history of battles and political strategy but not the practical issues linked to naval warfare. Yet having fleets of hundreds of ships with 150 000 to 200 000 men onboard meant huge stocks of food and, especially, water had to be provided, money for pay raised, etc. Thus the book is, on those aspects, limited. One should also forget about the philosophical and internal politics consequences of a fleet , despite interesting ancient texts on the subject, with Cicero having the same opinion as, for example, Aristotle on the subject of the link between fleet and empire, a topic which is but touched on in the conclusions. But as a chronological narrative of the naval aspects of the wars of the time this book will serve well, a pleasant reading for non-specialist readers and allow them to see some trends in ship building and ship use by the powers of the Mediterranean. A first trend is the stabilization of the size of the ships around two main types of warships, the quinquereme and the quadrireme, with larger 6’s, 7’s, 8’s, 9’s or more being a product of the early Hellenistic period. Second is the fact that few powers had permanent fleets because, amongst other factors, available resources and skills made it easy to quickly build new fleets. A point not mentioned by Grainger but which struck me is that the states which did indeed have permanent large fleets were places where the wood had to be imported : Athens (wood from Thrace), Rhodes (wood from Asia Minor’s coast), Ptolemaic Egypt (wood from Lebanon or Asia Minor) and Carthage. Nations like Rome or Macedonia did not have such needs because resources were always available. The Seleucid Kingdom being an exception due to its difficulties obtaining a naval base on the Mediterranean. On the formal side of things, one will note the fact that footnotes are mainly used in order to refer to ancient sources, with a reasonably large bibliography at the end (but one might be surprised by the absence of Angelo Chaniotis’ work, for example). Also some editorial work could have been done to delete some duplicate lines or sentences, but the book is generally well done. So in conclusion, reading this book might be an introduction to a side of things that is often not well covered in histories (both ancient and modern) but certainly requires much more to be a real source of information for the advanced reader, be it a learned amateur or a specialist on the topic.